Khashoggi allegedly disappeared and has been reported killed at the hands of Saudi consulate staff in Istanbul, Turkey. Of course, the US, UK, EU, Turkey, and Saudi Arabia are among the most dubious actors in modern geopolitics. Ascertaining the truth regarding the events surrounding Khashoggi may ultimately turn out to be an insurmountable task. The Khashoggi crisis has called attention to a largely overlooked Saudi-led war in Yemen. On a rare trip to the front line, New York Times journalists found Yemenis fighting and dying in a war that has gone nowhere. It was the systematic and concerted cover up by the Western media regarding the war – which began in 2015 – that provided Saudi Arabia the impunity with which it executed the war. The Saudi-led war in Yemen has ground on for more than three years, killing thousands of civilians and creating what the United Nations calls the world’s worst humanitarian crisis. But it took the crisis over the apparent murder of the dissident Jamal Khashoggi in a Saudi consulate two weeks ago for the world to take notice. Saudi Arabia’s brash young crown prince, Mohammed bin Salman, under scrutiny over the Khashoggi case, now faces a fresh reckoning for his ruthless prosecution of the war in Yemen — yet another foreign policy debacle for Saudi Arabia, and a catastrophe for the Arab world’s poorest country. Nowhere in the New York Times’ piece is a single, even oblique mention made of the US role in the war. However – in fact – the war is being fought with US-made warplanes, refueled by US Air Force-crewed aerial refueling aircraft, dropping US-built ordnance on targets selected by US intelligence agencies, with the help of US special forces on the ground directly assisting Saudi forces. They appear to contradict Pentagon statements that American military assistance to the Saudi-led campaign in Yemen is limited to aircraft refueling, logistics and general intelligence sharing. 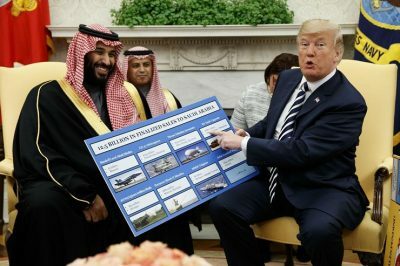 And indeed, the war in Yemen is not a “Saudi-led war,” it is in fact just one of America’s many “secret wars.” It is secret specifically because of the complicity of newspapers like the New York Times, only now cynically and dishonestly reporting on the Yemen war as part of a concerted campaign aimed at decoupling US culpability and leaving it entirely with Riyadh. For years before the Khashoggi incident, the New York Times and others were more than content with burying and spinning news about Yemen, or not covering it at all. The Western media demonstrates its absolute contempt for the intelligence of its collective audience. Their sudden concern and feigned outrage aimed at Saudi Arabia tenuously papers over decades of Saudi atrocities both inside Saudi Arabia itself, and across the world through its key role in state sponsored terrorism. While the article claims “successive Saudi governments lost track of the effort” and that funding is now provided by “Saudi-based “foundations,”” this is not true. There are no “successive governments” in Saudi Arabia. The nation since its founding has been run by a single family – the House of Saud. And while Saudi-based foundations may be the conduit through which Wahhabism is organized, funded, and directed, it most certainly is done at the behest of Riyadh in a process fully underwritten by Washington. Among Washington’s other “secret wars” are Libya and Syria where terrorists recruited, radicalized, trained, funded, and armed through US-Saudi funded Wahhabism were unleashed on the battlefield. Amid these two conflicts, newspapers like the New York Times worked overtime providing them with public exposure – seeking to sell to the public greater and more direct Western military intervention. In Libya, these efforts resulted in a NATO-led air campaign that eventually toppled the Libyan government and plunged the nation into years of infighting, terrorism, slavery, and enduring dysfunction that persists today. In Syria, the gambit fell short when Russia intervened at the request of Damascus, effectively blocking a similar NATO-led Libya-style air campaign. Russian warplanes targeted NATO supply routes out of Turkey feeding terrorist organizations operating inside Syrian territory, and ultimately turned the tide of the war. And just as the US and Saudi Arabia used terrorist organizations in Libya and Syria to fight their proxy wars, an AP investigation revealed they were doing likewise in Yemen. Thus, the Western media has always been and is still fully aware of the true nature of Saudi Arabia’s decades-long geopolitical trajectory – as it was the West and more specifically the US and UK who helped launch it in the first place. And it was the Western media who all along helped spin it on its way. The deceitful and intelligence-insulting narratives now being peddled by papers like the New York Times and others are unacceptable. If Riyadh falls, so too must those in Washington and London who built Riyadh up and walked with it – bloody hand-in-bloody hand – every step of the way. Attempts to decouple Western culpability from Saudi atrocities is an illustration of the immense duplicity and impropriety of Western political and media circles. But it is also a warning to the rest of Washington and London’s “allies”- like the current regime in Ukraine – who believe their relationship and complicity with, as well as their obedience to the West affords them inexhaustible impunity. The West picks weak, dependent, and dysfunctional political, military, and economic partners specifically because their very nature serves as the perfect check to keep them under control and if need be, to dispose of expediently. What’s Really Behind the Khashoggi Fallout? For now, it is unclear whether the fallout between the US and Saudi Arabia is real or imagined. The US and Turkey may be using Saudi Arabia to expunge their responsibility for their joint support of global terrorism alongside Riyadh, or perhaps to preemptively decouple from Riyadh ahead of a planned “Saudi” provocation against Iran. Or Riyadh may have refused requests made by Washington and is now being pressured to reverse its decision. So far, absent are the sort of aggressive steps taken when Washington faces a real enemy it seeks to inflict damage upon. Unlike with Russia when baseless accusations were made regarding election interference, the downing of MH-17, or the entire Skripal affair – there are no sanctions being discussed regarding Riydah. Weapons and US military support still flow to Saudi Arabia and the war in Yemen continues unabated, all while the US military continues providing Riyadh with defacto protection with its forces scattered across the Middle East. Until these facts on the ground change, we may simply be witnessing geopolitical theater where Saudi Arabia is elected to play the “villain” and absorbs responsibility for years, if not decades of atrocities jointly committed with its Anglo-American sponsors. By doing so, the US can save face and leave Riyadh with the broken pieces of their collective and ill-conceived regional and global policies. Only time will tell. One fact we can be certain of is that neither the US nor Saudi Arabia can be relied on for the truth. If the truth surrounding Khashoggi’s fate ever does emerge, it will not be from the Western or Saudi media nor from representatives of their respective capitals.